More detailed comparison of the PSR-S970 and PSR-975 plus a full specification comparison sheet for the latest five models are further down this article page. 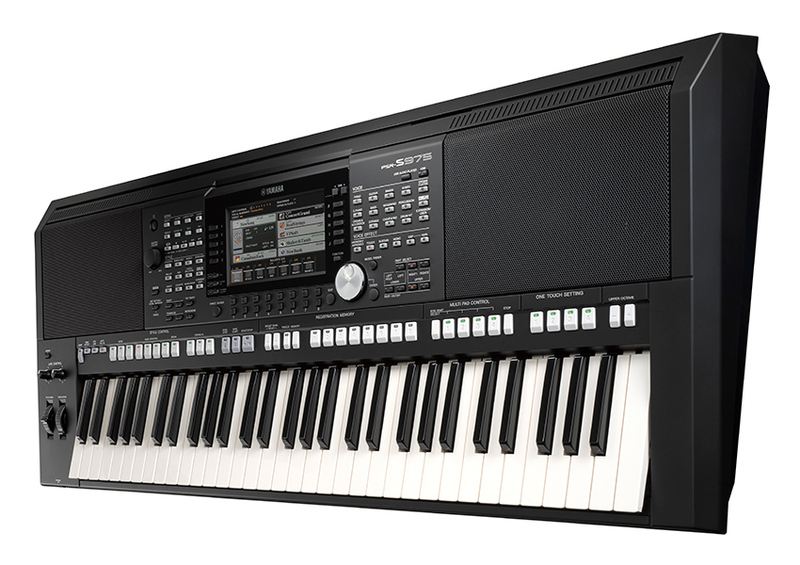 Yamaha introduced its first S Series arranger workstation keyboard in July 2006, meaning the range is well on its way to its twelfth birthday. Although we don’t know what the “S” stands for, it’s clear this range was targeted at the more advanced and professional musician. The first model launched four years after the Tyros, and the S series borrows some features from the Tyros including sound generation and performance features such as Super Articulation Voices and Organ flutes. The PSR-S500 launched in 2006, followed by the more feature-laden PSR-S700 and PSR-S900 models in 2007. 2008 saw the introduction of the PSR-S550, while the PSR-S710 and PSR-S910 upgraded their S700 and S900 siblings in 2009. In 2010 came the PSR-S650, with the PSR-S750 and PSR-S950 arriving in 2012. 2015 saw the launch of the PSR-S670, PSR-S770 and PSR-S970. In 2018 Yamaha launched the PSR-S775 and PSR-S975. The table below shows the main differences between the 14 models. Scroll/drag left-right to see the whole table. We’ve only shown the RRP for models currently available, as historic data is proving difficult to find and, in any case, becomes rather meaningless after several years have passed and models are superseded. Interesting to note the numbering Yamaha has used. The higher the first number after the S, the more feature-laden the keyboard is. The two following numbers show the succession of instruments in that particular class. For example, the S700 has a greater feature set than the S500. The S710 supersedes the S700. All fourteen keyboards feature the same 61-key full-size organ/synth style key layout – no other keyboard sizes or weights have been introduced. They all have roughly the same form factors, though vary in weight somewhat, and use Yamaha’s AWM sound generation technology. Polyphony started out at just 32 notes, rising to 128 on the later models. All but the first keyboard (PSR-S500) have a 16-track sequencer on board. They all have some type of LCD (non touchscreen) with later models having colour instead of monochrome, and widescreen on the 2018 models. As you’d expect, the number of voices and accompaniments has also increased over time. The flagship PSR-S975 (and its predecessor the PSR-S970) has a host of ways of controlling music performance, including two live controllers which can be assigned to a whole host of parameters, vocal harmony and vocoder functions, microphone/guitar audio input, arpeggiator, and USB audio playback with time stretch, pitch shift, and vocal cancel functions. The PSR-S975/PSR-S970 has Yamaha’s Virtual Circuitry Modeling (VCM) technology that simulates the effects of phaser, Wah, compressors, and phasers at circuit level. The other models feature a subset of these features but are still highly capable instruments. Currently the latest five models are still officially in production by Yamaha. That’s the PSR-S670, PSR-S770, PSR-S775, PSR-S970 and PSR-S975. The S Series of keyboards are significantly cheaper than the Genos, with even the top-of-line PSR-S975 being around half the price of the 61-key Tyros5. Although you don’t get all the features of the Genos, which is Yamaha’s flagship arranger workstation, the S Series of instruments are still worthy music keyboards for both studio and live work. I’d suggest any of the models post-2010 would also be worth picking up second-hand, so long as they are in good condition. Though they have fewer features, they’re still laden with enough to keep many musicians happy, and can be expanded if desired. As of February 2018, we’re in a transition period, where the two new Yamaha models (S775, S975) are listed with the same RRP as the models they supersede. However, we’d expect the S770 and S970 to be reduced in price somewhat, and gradually phased out, over time. That said, it’s unusual to have to pay the full RRP for these instruments anyway, and you could expect some music dealerships to want to sell off “old” stock to make way for the latest PSR-S keyboards. The PSR-S975 is Yamaha’s 2018 flagship S Series model and builds on the PSR-S970, which was released in 2015. The PSR-S970 is still available new from Yamaha and dealers, so let’s take a look at whether the PSR-S975 is a significant upgrade, and hence whether you should go for the newer model or buy the older S970. How an instrument looks may not be the determining factor in a purchase decision, but it’s not unimportant. The PSR-S970 has a metallic dark grey body, while the PSR-S975 is suited in black. Size-wise, the instruments are identical, at 39.45″W x 5.93″H x 17.2″D (100.2cm x 14.8cm x 43.7cm) and weighing 25.57lbs (11.6kg). There’s no aftertouch on either keyboard. The touch response can be set to five different modes: Hard1, Hard2, Medium, Soft1, Soft2. Both models come with a pitch bend and modulation wheel, plus two assignable control knobs. Both keyboards use Yamaha’s AWM Stereo Sampling tone generation technology, with a maximum 128 notes of polyphony. Both models are XG, GS, GM and GM2 compatible. The PSR-S970 has 512MB of expansion memory for voices. The PSR-S975 has 768MB. Both instruments have a number of other features which don’t vary between the two. Concluding, we can see the two instruments are very similar. Look, feel and sound technology are the same. What you’re getting in the new model is more sounds, styles and effects. The question is whether you need that additional content. Of course, sounds and accompaniments make or break an arranger workstation, so yup could argue it’s worth getting the latest model to benefit from those. Then again, do you really use all the sounds provided on a keyboard? The basic instruments most composers require are in both instruments, and if you want more it’s possible to use the keyboard to control additional hardware or DAW software. We’ve created a comparison table for the latest, current five PSR-S models, using all the specification data provided by Yamaha. This includes the PSR-S670, PSR-S770, PSR-S775, PSR-S970 and PSR-S975. Featured Voices 11 Mega Voices, 19 Sweet! Voices, 28 Cool! Voices, 19 Live! Voices 67 Super Articulation!, 23 Mega Voices, 27 Sweet! Voices, 64 Cool! Voices, 71 Live! Voices, 20 Organ Flutes! 76 S.Art!, 23 Mega Voices, 28 Sweet! Voices, 64 Cool! Voices, 81 Live! Voices, 20 Organ Flutes! 131 Super Articulation!, 30 Mega Voices, 31 Sweet! Voices, 74 Cool! Voices, 89 Live! Voices, 30 Organ Flutes! 140 S.Art!, 30 Mega Voices, 32 Sweet! Voices, 74 Cool! Voices, 99 Live! Voices, 30 Organ Flutes!